Since the release on eXtreme Gammon, there have been several independent studies on the strength of the program. We'd like to thank all the people who did all that hard and very long work, particularly Michael Depreli. 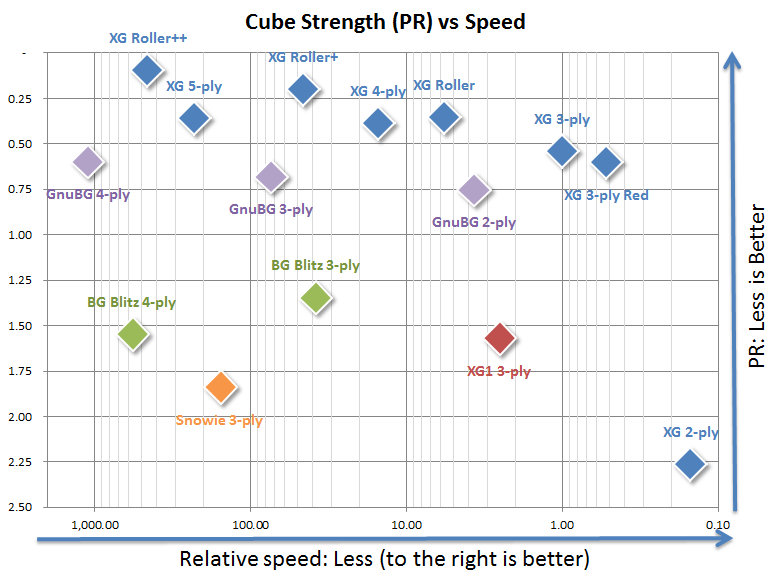 The study is comparing the different top programs (at multiple strength level). Using 500 money games any difference of opinion is analyzed very deeply using a rollout. The mistakes each program/level makes are accumulated. This is a long process (more than 5000 moves or cube decisions needed to the rolled). 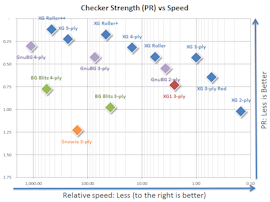 Rollouts were made using eXtreme Gammon 2 (Rollout parameters: 3-ply Checker, XGRoller For cube, Roll until the 95% confidence of the equity is less than 0.005, minimum 1296 trials). All numbers are normalized equity. The process does not take into account search interval. Each candidate was analyzed in the level requested regardless of the search interval used. 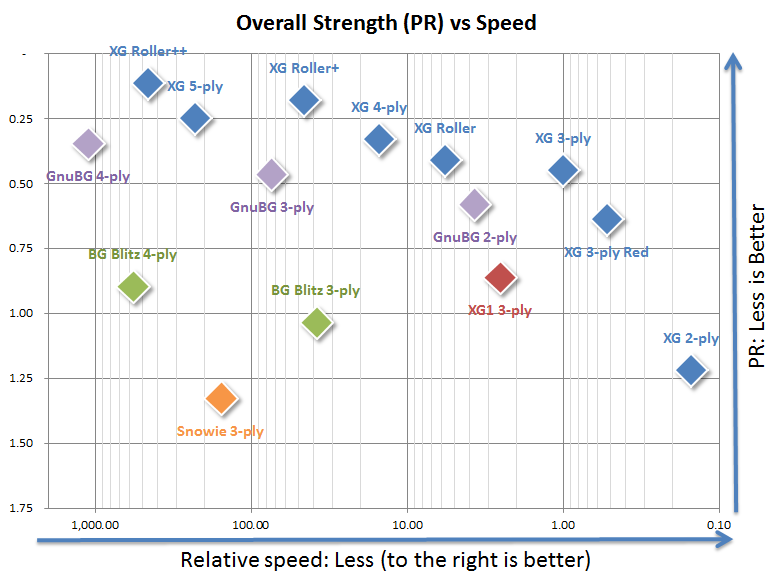 From the table one can see that eXtreme Gammon 2, using 3-ply makes about twice less error than the previous version at the same level (and is faster). eXtreme Gammon 2 XGRoller+, which is faster than Snowie 3-ply makes 6 times less error than Snowie. 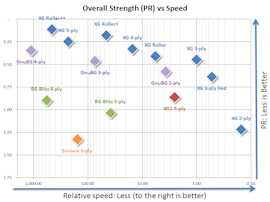 Here is a chart that shows the relative strength based on this study (in Elo compared to XG 3-ply). The speed test were performed by GameSite 2000 ltd and are not from an independent source. Note about BGBlitz: as it cannot analyze a full match. Its speed was determined using Rollout speed. Important: the 2010 Study was made using eXtreme Gammon 1. The newest version is noticeably stronger. 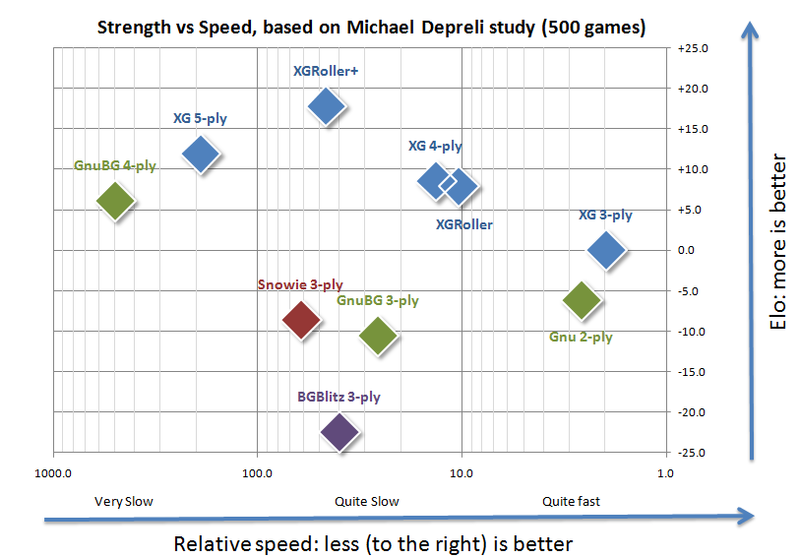 Michael Depreli is in the process of rolling the position again using eXtreme Gammon 2 with much stronger settings than the one use in the 2010 one. The new results will also include eXtreme Gammon 2 results and will be soon available. 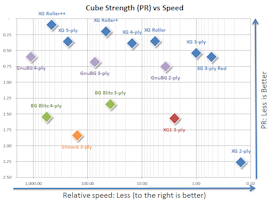 The study is comparing the different top programs (at multiple strength level). Using 500 money games any difference of opinion is analyzed very deeply using a rollout. The mistake each program/level makes are accumulated. This is a long process (more than 4500 moves or cube decisions needed to the rolled). The project got completed after 6 month of intense analysis. Rollouts were made using GnuBG (Rollout parameters GnuBG 2-ply world class 1296 trials or 2.33 JSD (98% conf) if sooner). All number are normalized equity. We'd like to commend Michael for his extraordinary dedication and all his hard work to get that project completed. Note about BGBlitz: as it cannot analyze a full match. Its speed was determined using Rollout speed. Click to see a bigger picture. Phil Simborg ran a test at Mike Corbett's request on 10 positions of his book. On 9 positions eXtreme Gammon version 1 did better than Snowie. 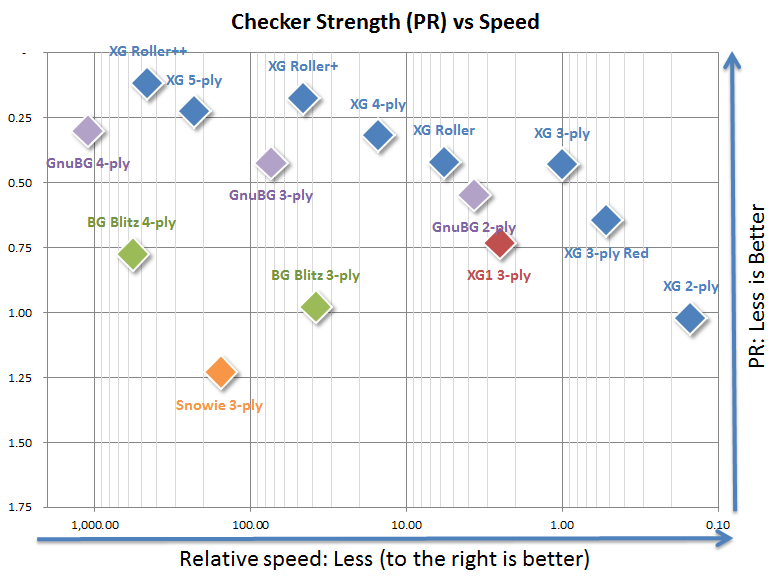 GnuBG did better on 6 (all move in 3-ply (2-ply for GnuBG). As the positions picked were the ones Snowie gets wrong this test does not reflect the difference between eXtreme Gammon and Snowie. It does, however show the difference between eXtreme Gammon and GnuBG.